In this blog, I’ll walk you through the steps and corresponding source code blocks to help make your LoopBack app interact with Cassandra Materialized Views. npm We’ve provided extensive documentation for it on loopback.io. 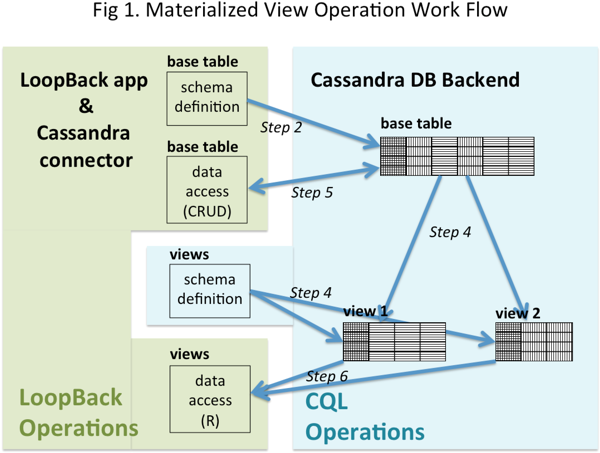 (1) LoopBack app & Cassandra connector, which is the client, and; (2) the Cassandra database back end. Green background shows (1) LoopBack API calls down to the Cassandra driver. Blue background shows (2) CQL and Cassandra internal API calls over the Internet as well as the Cassandra system implemented in Java. As the color implies, the blue arrows show Cassandra-side data flow directions in the Cassandra back end. We are going to examine each step. In this blog, we use db as the data source which is created in test/init.js. This step is not included in the figure. // of the back end data base. As shown in the area of blue background, there is a base table and two views associated with the base table. In the example, the base table is called allInfo. The base table is an ordinary table, i.e., the table schema is defined and the model is created by db.define LoopBack operation and the schema is populated to the database back end by db.automigrate LoopBack operation. Materialized views look exactly like tables to your LoopBack app. However, LoopBack doesn’t provides define and automigrate for Materialized Views. Thus, we need to use db.createModel LoopBack operation and create a model for each materialized view. We will use the model to read data from the materialized view. As the arrows in the figure show, the app can only read from the materialized view. You may be wondering why there is no Step 3 shown in the figure. That’s because the model creation is a pure LoopBack operation and independent from the Cassandra back end. We need to write CQL and execute the CQL with db.connector.execute. The view schema used in the CQL here and the table schema used in the model creation in Step 3 must agree. In the second db.connector.execute CQL, member field is not SELECT-ed, but shows up in the PRIMARY KEY definition. Cassandra does not warn nor error but brings in all the primary key fields of the base table by default to the view’s PRIMARY KEY. The base table allInfo is an ordinary table. You can write and read data to/from the base table. LoopBack find operations can be used to read data from the materialized view. Once created, the materialized views can be read like tables. // find rows from `members` where 'team` is `Blue`. // do stuff with rows here. // find rows from `members` where 'registered` is `false`. // find rows from `members` where `team` is 'Blue' and 'registered` is `true`. // find rows from `teams` where `league` is 'North', then return `league` and `team` fields. // find rows from `teams` where `team` is 'Green', then return all fields but `member`. The order of the steps is chosen for readability. When you design tables and materialized views, you might want to do the view schema design first in normalized form, then, design the base table. Also, note that all primary key fields of the base table are used in primary key of each view by default (and you cannot change that) when CREATE MATERIALIZED VIEW. One additional non-primary-in-base-table field can be used in the view’s primary key. The example code used in this blog is available on github.com.